Cranleigh Chamber of Commerce has negotiated special discounted terms for our members who advertise with VantagePoint magazine. VantagePoint is the free monthly Royal Mail delivered community magazine, published by the locally based team at Vantage Publishing. They have a successful track record in magazine publishing, having published local magazines since 2009. VantagePoint champions and promotes local businesses to the local community to benefit the local economy. Their five magazines serve the communities of Cranleigh, Dorking, Farnham, Godalming, Guildford, Haslemere, Leatherhead, Midhurst and Petworth. All magazines are hand delivered by Royal Mail to 108,193 local homes. The magazine is delivered during the first week of the month and is packed full of varied and interesting features including food, gardening, local history, travel, walks, and competitions. The magazine also features their Jottings section, which offers readers the greatest coverage of forthcoming local events and organisations, and also extends the shelf life of the magazine. The following discounted rates and editorial offers will apply to advertising by Cranleigh Chamber of Commerce members within the Godalming, Cranleigh and Villages edition of VantagePoint. This edition covers the GU6, GU7 and GU8 postcodes, with delivery by Royal Mail which means 23,402 households will receive a copy. To take advantage of this special offer from VantagePoint, please contact Marcus Atkins on 01483 420173 or by email to marcus@vantagepublishing.co.uk. Cranleigh Chamber of Commerce is pleased to be a part of the Cranleigh Community Resilience Group. This group, led by Surrey County Council, consists of several local organisations working together to explore the role and resilience of individuals and communities before, during and after an emergency. Community resilience is about communities and individuals preparing and planning for an emergency so that if a major incident were to happen, they would be able to put a carefully prepared plan into action, so that know they what to do. You can find out more about this group during a drop-in meeting taking place on Thursday 9th June 2016 between 4pm and 7.30pm in Cranleigh Village Hall. Following the success of our recent sold-out EU Referendum Debate, Cranleigh Chamber of Commerce is bringing the event back to the village next month. Join us at Cranleigh Arts Centre at 7pm on Tuesday 14th June 2016 for a robust panel debate and an opportunity to get your EU Referendum questions answered by experts from both sides of the argument. Our panelists will take questions from the audience on a range of subjects including the economy, immigration and sovereignty, in order to debate the facts, figures and speculation. We have invited Mark Nottingham and Harry Aldridge to participate in this debate, expertly chaired by Philip Calvert. Mark Nottingham is Head of Office for Mary Honeyball MEP. He is a lecturer on Europe at the Civil Service College and Member of the Executive of the East Kent European Movement. Harry Aldridge is director of Skypax.com and former UKIP parliamentary candidate for Guildford. Harry is back by popular demand after featuring in our first panel debate. Our chairman for the debate is Philip Calvert; a Fellow of the Professional Speaking Association and an award-winning social networking entrepreneur. If you need help making up your mind ahead of the big vote the following week, or simply want to better understand each side of the argument, this panel debate will educate, inform and entertain. We will be conducting confidential polls before and after the panel debate, to understand how Cranleigh might be voting in the referendum. Tickets for Cranleigh Decides are only £5 each with all proceeds helping to fund the Cranleigh Christmas Lights this year. Space at this debate is strictly limited and tickets must be purchased in advance. The event is generously sponsored by Hart Brown Solicitors. Find out more and book your tickets online at https://www.eventbrite.co.uk/e/cranleigh-decides-eu-referendum-debate-tickets-25545826254. Members of Farnham, Cranleigh and Godalming Chambers are coming together to meet, socialise and network at the newly re-furbished and upgraded Frensham Pond Hotel. The hotel is nestled against the stunningly beautiful Frensham Pond and has recently been upgraded by the AA from 3 to 4 Stars in recognition of its excellent quality service and standards across all areas of the business. Join us on Thursday 16th June from 5.30pm to enjoy a welcome drink and some networking. An exquisite finger food buffet will be served at around 6.15 pm. All this for £12 which you can book here. This Saturday 21st May 2016 Cranleigh Parish Council will be hosting a Community Showcase in the Village Hall. The event runs from 3pm to 6pm. It is an opportunity for local residents and business owners to find out more about organisations in the village, to discover what they have to offer for the community. Some of the local schools will be providing musical entertainment throughout the afternoon and Cranleigh Country Market are providing light refreshments. Cranleigh Chamber of Commerce will be exhibiting at the Community Showcase. Do pop in to see us at the Showcase to find out more about the Chamber and our activities in the village. The event will conclude at 6pm with the Annual Parish Meeting which is expected to end no later than 6.30pm. Cranleigh Chamber of Commerce members enjoyed breakfast at The Stables Restaurant this morning, with informative talks about cycling and helping the local community. At the sold out breakfast meeting, business people packed the restaurant to enjoy a morning of networking, delicious food and presentations. Andrew Kolmar of Rotary Club of Cranleigh described the work done internationally and locally by the Rotary, encouraging Chamber of Commerce members to volunteer at specific events in the future. The main presentation came from Tom Hough, co-owner of bike shop (and cafe) Maison du Velo in Cranleigh High Street. Tom described his entrepreneurial journey and why cycling has become so popular in the UK recently. He explained that cycling is good for business, with employees much fitter and less likely to take time off work due to illness. Tom told us that Cranleigh is the centre for cycling in the South East of England, having become a real thoroughfare for road cyclists with access to the surrounding Surrey Hills. It also appeals to mountain bikers, with some of the best mountain biking areas in the region, and the Downs Link offers excellent cycling for families. Our next breakfast meeting takes place at Cranleigh School on Wednesday 15th June, where our guest speaker is headmaster Martin Reader, talking about the business of education. Do also join us at the Cranleigh Community Showcase in the Village Hall from 3-6pm this Saturday, where Cranleigh Chamber of Commerce will be exhibiting alongside many other local organisations. 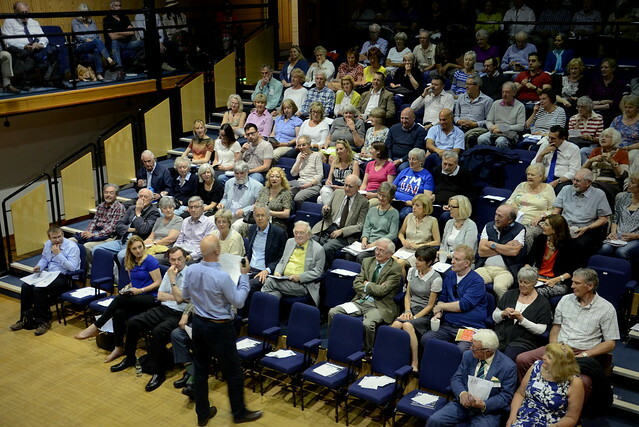 It was a full house at Cranleigh Arts Centre on Friday lunchtime for The Big Cranleigh EU Referendum Debate, chaired by The Rt Hon Anne Milton MP. 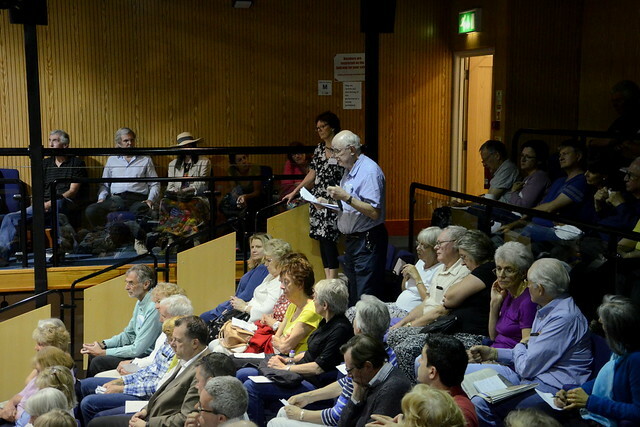 Business owners and members of the public packed the Jack Wagg auditorium to pose their questions to the expert panel, representing the Leave and Remain views. On the Leave side was Harry Aldridge, an export business owner and former UKIP parliamentary candidate for Guildford. 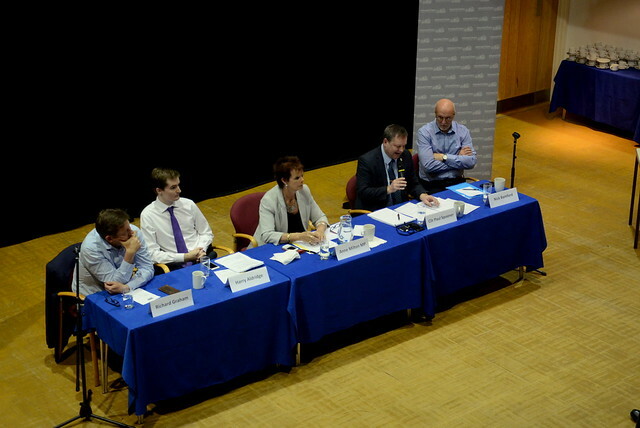 The Remain view was represented by Cllr Paul Spooner, the Conservative Leader of Guildford Borough Council. Following introductions by event sponsor Nick Bamford of Informed Choice, and from Anne Milton, both sides had an opportunity to present their opening statements before questions were taken from the floor. A lively debate followed, with questions asked by individuals who favoured the Leave and Remain camps, and a number of people who were clearly undecided and looking for more information on which to base their decisions. An entry poll taken before the debate found 50.4% of the audience were planned to vote Remain at the Referendum next month. Only 18.2% expressed Leave as their voting intention, with a significant 31.4% of the guests at the debate undecided. These voting intentions changed during the course of the debate, with a big shift in undecided voters, rising from 31.4% to 37%. The Remain camp declined to 45.4% and the Leave camp fell slightly to 17.6%. Our thanks to Anne Milton for doing an excellent job chairing the debate and exercising a firm hand during some passionate questioning from the audience! We would also like to thank the event sponsors Informed Choice, Cranleigh Arts Centre for providing the venue, Harry Alridge and Paul Spooner for sharing their expert views, and of course all of our guests for joining us on a Friday afternoon to debate the future of the UK in the European Union. How is access to finance changing for your business? The British Chambers of Commerce (BCC) and Cranleigh Chamber of Commerce are working together to better understand the conditions for businesses attempting to access external sources of finance. Please take five minutes to complete this survey. Access to finance remains a key issue for many businesses, particularly SMEs. The purpose of this survey is for the British Chambers of Commerce to better understand the conditions for Chamber members in accessing external sources of finance and assess awareness of alternative types of finance as well as Government initiatives to improve access to finance. The findings of this survey will help sustain the ongoing effort by the British Chambers of Commerce to represent business at the very highest levels of Government on this important issue. Thank you for your help – your input is greatly valued. More British businesses are in favour of the UK leaving the European Union compared to earlier this year. This is according to the latest survey from the British Chambers of Commerce. However, most of its members want to remain in the EU. According to the British Chambers of Commerce, 37% of its members will vote to leave the EU at the referendum next month. The proportion of BCC members voting to leave has risen from 30% at the time of the last survey, which was carried out in late January and early February this year. 54% of BCC members will vote to remain. This has fallen from 60% when the survey was last conducted. It is worth noting that the latest BCC online survey of its members was carried out before new reports from Britain’s finance ministry, the International Monetary Fund and others warning of economic damage if Britain leaves the EU. The survey also revealed that 71% of BCC members found the EU referendum debate was having no impact on sales. 80% of its members said the debate was having no impact on investment. Cranleigh Chamber of Commerce is hosting an EU Referendum Debate at Cranleigh Arts Centre at lunchtime on Friday 13th May, chaired by Anne Milton MP. We will be carrying out an entry and exit poll of attendees, to get a better picture of voting intentions locally. A limited number of free tickets are still available for this event, after it sold out earlier today and we were able to release 10 additional spaces. 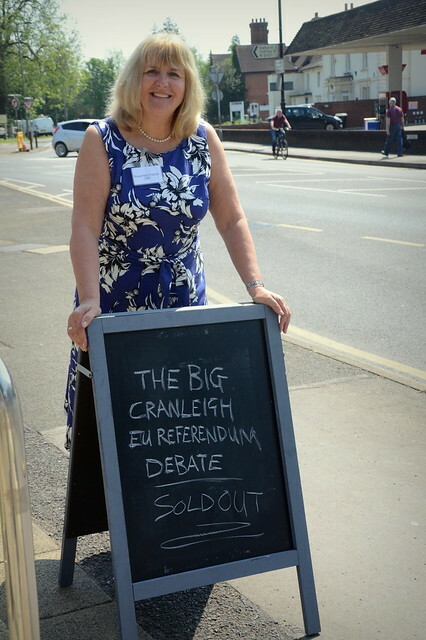 Demand for free tickets to the Big Cranleigh EU Referendum Debate, hosted by Cranleigh Chamber of Commerce and chaired by Anne Milton MP, has been exceptionally high. 90 business owners and local residents have already reserved their free seats at this event next Friday, 13th May, at Cranleigh Arts Centre. We only have 40 seats left which we expect to go quickly, so please reserve your free ticket ASAP at www.eventbrite.co.uk/e/the-big-cranleigh-eu-referendum-debate-tickets-24596046437. Panelists representing both sides of the debate will answer questions from the audience and debate the facts, figures and speculation, with a particular focus on the consequences for the local economy. If you need help making up your mind ahead of the big vote in June, or simply want to better understand each side of the argument, this panel debate will educate, inform and entertain. Reserve your free ticket now at www.eventbrite.co.uk/e/the-big-cranleigh-eu-referendum-debate-tickets-24596046437 to avoid disappointment.